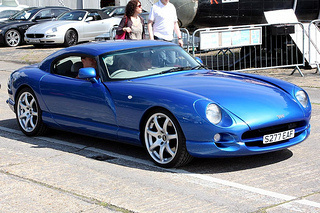 The concept of the TVR Cerbera sports car began in 1993, with a prototype premiered at that years London Motor Show, where it received and enthusiastic reception. Whilst it had a striking resemblance to the Chimaera, it was a very different car with new brakes, supsension, and a lengthened Chimaera chassis. The final prototype of the Cerbera was introduced at the 1994 Birmingham Motor Show, at which 276 pre-production orders were taken. 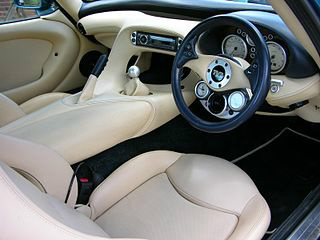 The car was unique in the fact that it was a 2+2, fixed head coupe, and powered by an engine developed and produced by TVR themselves. Compare this with the Chimaera and Griffith, where both were two seater convertibles, powered by a Rover V8 engine. TVR's new engine, initially designated the AJP8, and later referred to as the "Speed Eight", was designed as a race engine, with a combination of light weight and high power. The AJP engines were first assessed on the track, and a works team was created to enter the National GT series with a Cerbera GT. 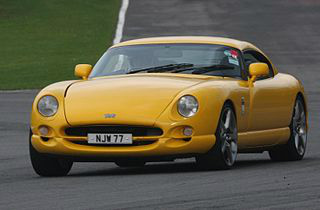 The TVR Cerbera sports car, finally launched in 1996, was powered by the AJP8 4.2 litre, V8 engine, with two valves per cylinder, developing 360 bhp at 6500 rpm, and 320 ft/lbs of torque at 4500 rpm. In July 1997, the AJP8 4.5 litre, V8 was introduced, developing 420 bhp at 6750 rpm, and 380 ft/lbs of torque at 5500 rpm. With a 0-150 mph time of 17.9 secs, the Cerbera 4.5 Red Rose was a car to be reckoned with. Fitted with larger brakes, modified suspension, and larger wheels and tyres, it offered superlative braking and handling, and capable of stopping from 100 mph in a mere 3.8 secs. 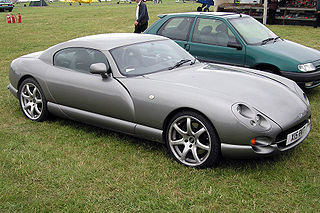 In April 1998, the 4 litre, straight 6-cylinder engine, with four valves per cylinder, was introduced, and which TVR had developed as the Speed Six, and hence the name Cerbera Speed Six. The Speed Six model was intended to be a Grand Tourer, rather than a race car. Although classified as a 2+2, the passenger seat was designed to slide further forward than the driver's seat, to create more room for the person seated behind the passenger. 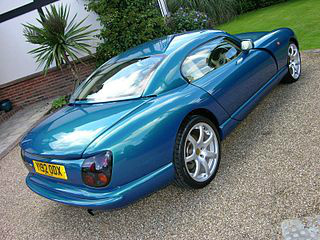 Such an arrangement was referred to by TVR as a 3+1 design. Interestingly, the car was started by pressing a black button on the dashboard, and waiting for the electronic diagnostics to interact. In 2000, the 4.5 litre variant was offered in the form of a lightweight option, which used a lighter bonnet, doors, and boot lid, and had a slightly modified interior. In 2002, the headlights were recessed into the wings for even smoother lines, and the suspension was upgraded. By this time, any Cerbera 4.5 could have a "Red Rose" conversion, which boosted output to 440 bhp at 7250 rpm, and 390 ft/lbs of torque at 5500 rpm. Reshaped inlet and exhaust valves, and a higher compression ratio accounted for half the increase in output, the rest when using super unleaded petrol. The conversion used a switch on the dashboard to control the fuel and ignition settings in the engine management system. Although the Cerbera was discontinued in 2003, TVR's new owner decided to honour "A bygone British sports car" with an online auction of "The last Cerbra", featuring a 4.5 litre, right hand drive unit, coloured white with Prussian Blue leather interior. Unfortunately, it was not a very reliable car, and there were many areas that could, and often did, go wrong. When the Cerbera was phased out, the AJP8 unit was discontinued, but all subsequent TVR's were powered by the Speed Six engine. 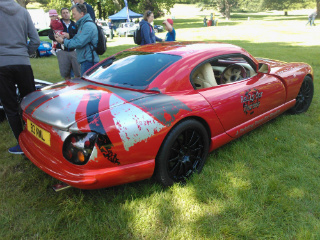 A 2011 TVR Cerbera Red Rose in good condition would fetch around £19,000/$30,000, with a similar 1998 Cerbera Speed Six fetching £20,000/$32,000, an exceptional Cerbera 4.2 at £27,000/$45,000, with good condition Cerbera's priced at between £11,000/$18,000 an £17,000/$27,000. Got an interesting Sports Car story to tell?